Since we just recently closed two units on Brickell Key and listed another in the Courts, we decided to give our followers a detailed market update for 2017 of the exclusive Brickell Key island.For those of you not familiar with Brickell Key, this private island is located just off of Brickell Bay Drive and offers incredible Bay views from its upscale buildings. There are shops and restaurants for residents to enjoy and a great running path for those with fitness in mind! We especially love the spa at the Mandarin Oriental Hotel! Each building also features private amenities such as swimming pools, Jacuzzis, gyms and concierge services. Now on to the state of the market. Mainland Brickell has seen a sudden rise in development and prices in the past 5 years, but Brickell Key has remained relatively unchanged due to the limited vacant land available for development.The recent boom for new construction was mainly funded with foreign capital from investors. As demand has waned in the last 24 months prices for Brickell have faltered. 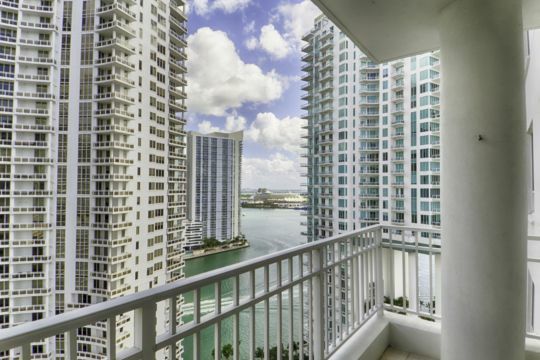 We recently highlighted the price drops off Brickell condos in a previous post which you can read here. On the other hand, Brickell Key pricing has only slightly dropped, but nowhere as much as the Brickell Market. Lets take a look at the stats below from 2016 to 2017 in Brickell Key. 1 bedroom and 3+ bedroom units have been relatively unchanged when it come to sale prices. 2 bedrooms have seen a decrease but the majority of units on Brickell Key are 2 bedrooms and inventory is higher for those models. The 2017 Market has started very strong and we expect the price levels to maintain throughout the remainder of the year. It will be interesting to see when the last phase of Brickell Key will be developed. Swire Properties, the developers of Brickell City Centre, are planning to add 668 additional residential units on the island in the coming years. Residences in Brickell Key typically range between $200,000 for studios and up to multi-million dollars for penthouses with water views. Our current listing is unit 2408 in The Courts. This is the largest two bedroom line in the building and has a split layout with double balconies. No expense was spared when upgrading the unit and you can watch a video tour below. We have the experience and knowledge to help you with all of your real estate needs in Brickell. If you are interested in buying, selling, renting or investing, call us today at (305) 809-7650 or fill out our contact form to schedule a consultation.